I bought this for our king size bed. It's a bit small for it so I put it on one of our queen size beds and its fit beautifully. The colors r even better than the pics. It matches everything also. Inspired from a global bohemian pattern which highlights color in an artistic format. An amazing artful way to decorate a bed. Stunning vintage medallion pattern in burgundy and gold tones in this NEW technique of printing which creates an artistic touch. Detailed border in a frame-like appeal. This also reverses to a contemporary printed design so you can switch your decor easily. Included is an elegant embroidered decorative pillow to complete the look. Easy Zipper closure for easy removal and cleaning. Care instructions: Dry clean preferred. Machine washable. 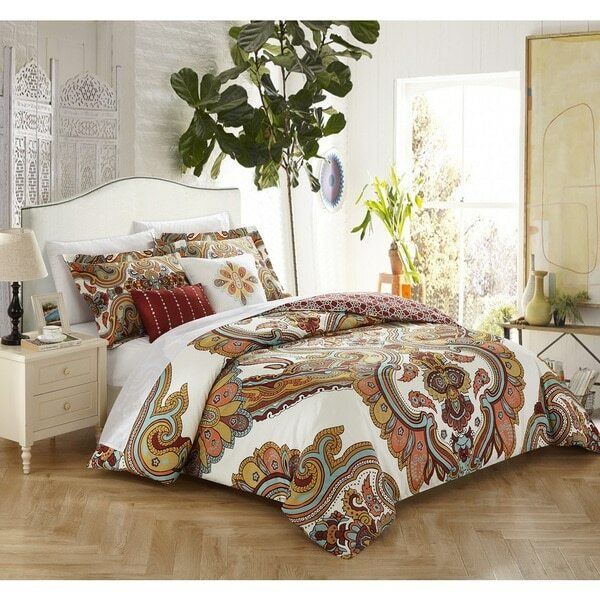 I have a few issues with this comforter set. First of all, it barely fits my split King bed and because it is cotton, it will shrink even more. The pillow shams are huge even with a king pillow, I could probably get another pillow in there. I'm hoping it does shrink! It is cotton so the wrinkling is to be expected. Then the coupe de gras: random rust-colored threads in the white part of the colorful side. Because it is reversible and the other side is a dark rust color, they used the dark rust color thread to secure the batting in place! it looks stupid. Now if this was one of those $ sets they sell on Overstock that would be one thing but this set is NOT CHEAP. I used to get such good quality from the O but I have been disappointed and even quit shopping here for over a year. Well, guess what? Back to plan A!! The colors are more beautiful than the picture shows. Very sturdy and well made. I bought for my daughter's dorm room and she absolutely loves it. I would definitely recommend this purchase. I love the look, it different from others I've purchased. "Do these come in California King"
This item does not currently come in a Cal King option. "DOES THIS COMFORTER SET HAVE A MATCHING SHOWER BY ANY CHANCE"
This set does not have a matching shower curtain.